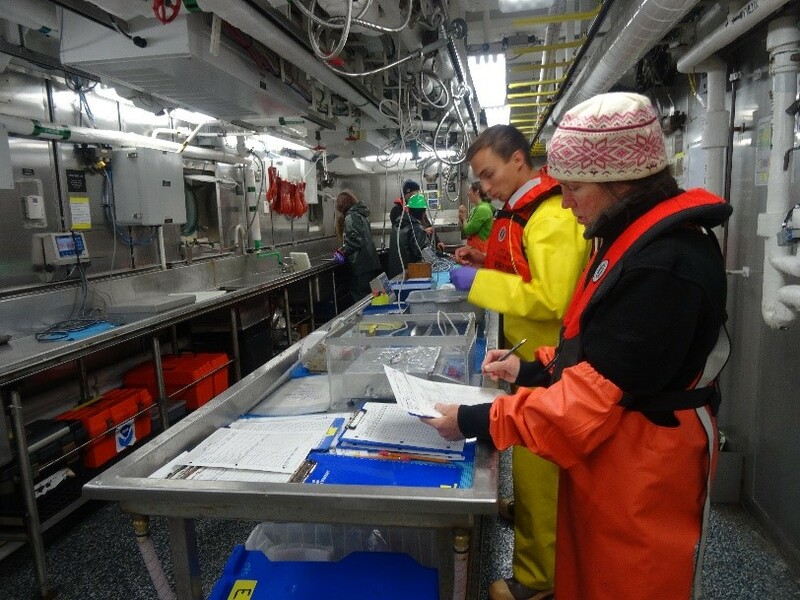 Although the scientists have not performed any fishing trawls since departing San Diego, there is a survey crew on board that has continuously been monitoring the water column for a variety of factors using acoustics and an instrument called a Conductivity/Temp/Depth (CTD) probe. Last night I was able to observe the launch and retrieval of a small, handheld CTD probe. It looks very much like a 2 ft torpedo. The electronics and sensors built into the probe measure such factors as salinity, sound speed, depth, and water temperature. This smaller probe is launched off the tail of the boat and let out on a line of filament from a reel that appears very similar to a typical fishing reel. It does not take more than a couple of minutes for the probe to sink to a depth of about 300 meters. Data is collected from the probe at various depths on the way down. 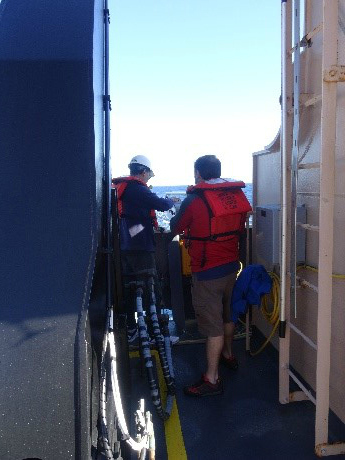 Once the probe has reached its target depth, it is simple reeled back in using a winch to retrieve it. This requires quite a bit of energy as the probe is deployed with enough line for it to end up about 3 miles behind the ship. 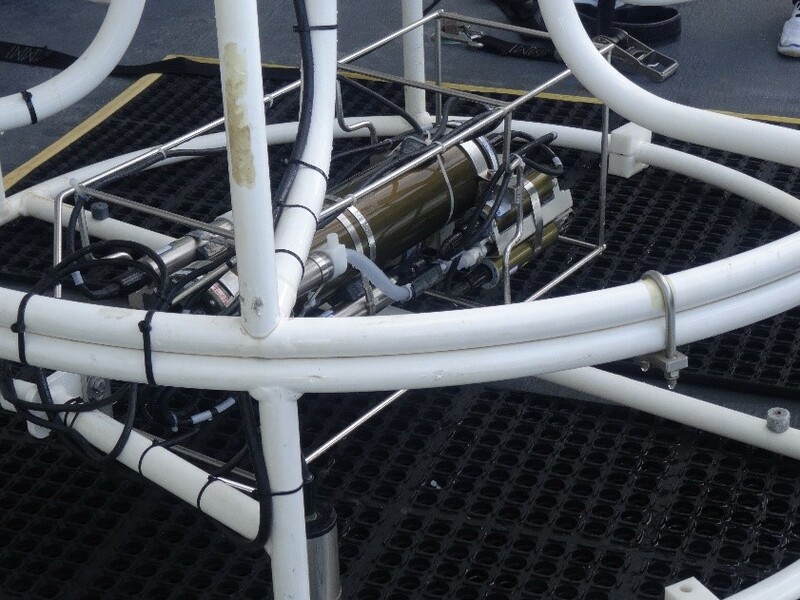 The data from this probe is then blue-toothed to the program used by those monitoring the water column acoustically. It help the techs make corrections in their acoustical readings. The Reuben Lasker also carries a larger version of the CTD probe with the additional capabilities such as water collection at various depths. However, this version requires the ship to be stationary. Taking measurements with the unit slows down the work of the day as each stop takes about 30 minutes from launch until retrieval. The launch of the larger CTD can be seen below. The data from the CDT probe is recorded real-time on the survey team’s computers. Below you can see how this data presents itself on their video screens. On the left video display you can see that there are several variables that are plotted against a depth vs. temperature. The green line tracks fluorescence (a measure of the chlorophyll concentration); the light blue line tracks dissolved oxygen; the red line represents temperature; the blue line is for salinity. Extension question for my students reading this: What correlations or relationships do you see happening as you observe the change in variables relative to changes in depth? 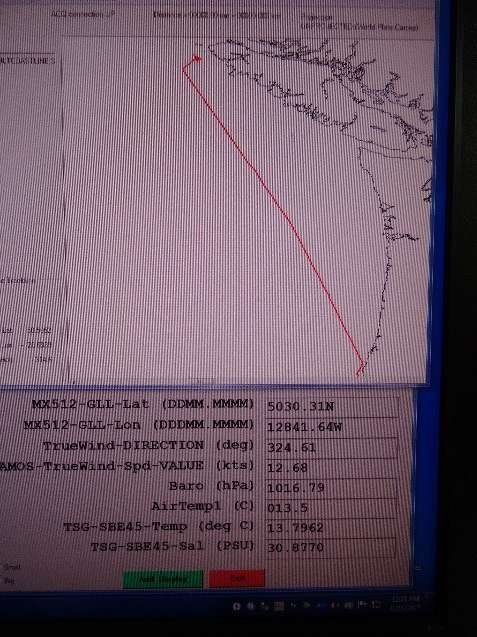 Here is the route taken by the Reuben Lasker during the past 24 hours or so. 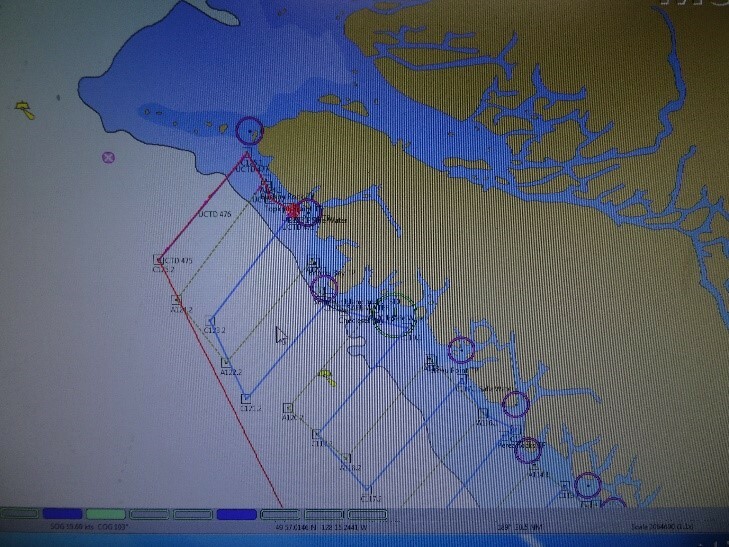 As you can see from the chart, the ship has now reached the northern-most end of Vancouver Island. This is where the CDT recordings, marine mammal watching, deployment of two sets of plankton nets (to be explained later) and fish trawling will begin along the predetermined transect lines. Note at the base of the screen the other parameters that are continuously recorded as the ship moves from place to place. The action on-board is increasing dramatically today. We have arrived at our outermost destination today, along the northernmost coast of Vancouver Island. The sights from the bridge are amazing…all this blue water and rugged, pine covered coastline. I am still waiting for that orca whale sighting! The waves are up today but I’m holding my own. Yeay! Especially as the night fishing will begin in a few hours. Unique activity of the day – I just finished a load of laundry! The ship possesses 3 small washer/dryer units so we can redo our towels and whatever else we have used up during the course of this first week. How serviceable can you get! I’ll retrieve mine as soon as dinner is over. We have set meal hours and if you miss…it’s leftovers for you! Best part of this is I am actually ready to eat a normal meal, even with the ship rocking the way it is today. I have now been assigned deck boots and a heavy duty set of rain gear to cover up with when the fish sorting begins. I can’t wait to see what all we pull up from these nutrient rich waters! 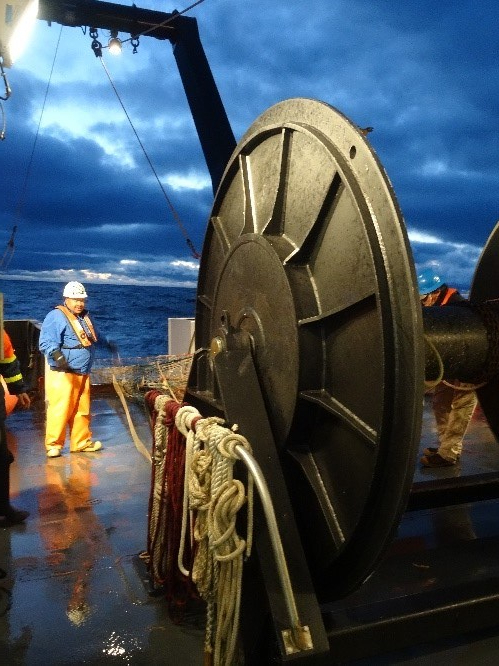 Much of the data collected by the CTD and acoustic equipment from the Reuben Lasker is entered into a large data set managed by CalCOFI (California Cooperative Oceanic Fisheries Investigation). Anyone interested in utilizing and analyzing this data can access it via the organization’s website located here. There is an incredible amount of information regarding the work and research completed by this group found on this site. Check it out! One of the lessons I want to take back to my students is not only a better understanding of some incredible career opportunities out there that they probably are not aware of, but also how some simple, almost by chance factors can influence our career choices. For example, in speaking with PJ Klavon one of the ship’s Officers on Duty (OOD), I asked how he came about becoming a NOAA officer. He said he was at a job fair and a NOAA staff member asked him if he would like to fish and captain a ship. He answered “Yes” and here he is, having been part of the NOAA program the past 7 years. I also met Sarah Donohoe, the ship’s navigator. She commented that while in middle school she happened to read the hardcover book about being a Teacher at Sea that NOAA produced a few years ago. It intrigued her then and now here she is, working her way up the chain of command having first earned a degree in Biology. 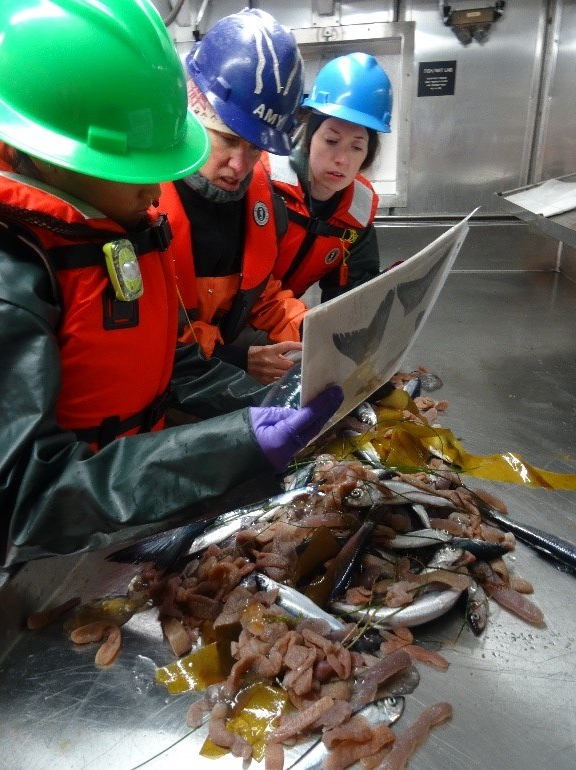 We headed out of the San Diego port on Monday, June 19 with the objective of traveling straight to Vancouver where we are to begin our main transects, collecting samples of fish throughout the night along a very specific path. The transect lines have been used for several years so that the data will show how species and population sizes change over time. Transect Lines are paths along which one counts and records occurrences of the species of study (e.g. sardines). It requires an observer to move along a fixed path, to count occurrences along the path and, at the same time (in some procedures), obtain the distance of the object from the path. There will be more on this to follow when we get to actively fishing in a couple of days. Consider the path on the diagram below (image from http://www.fao.org). Samplings are taken at regular intervals. The pathways are marked by longitude and latitude so they can be repeated as needed. Since we are mostly just cruising to our starting point, there has not been much research going on. The main activity has been to collect eggs from the water directly below the boat. This water is channeled through a tube containing a mesh filter capable of capturing organisms and eggs that are 5 microns in diameter or larger. There are two main egg types that the researchers are looking for – the eggs from anchovies and sardines. They are monitoring how many they find in the samples being collected every 30 minutes. This information can be compared to the water temperature, location of the vessel, and the size of schools of these organisms as observed via sonography. CUFES (Continuous underway fish egg sampler) Approx. 640 L/min of water flows through the apparatus illustrated below. The water flows through a tube that has the 5 micron mesh filter inside which collects the eggs, etc. found in that water sample. The sample is then rinsed into a petri dish, where the number of eggs of each species is identified and recorded. The sample is then placed in a 5% formalin/salt water solution for preservation and later study. The image below represents the eggs and multiple species of zooplankton that can be captured during one CUFES sample period. The anchovy eggs are a very distinct oval shape. See if you can find them in the sample below! I arrived in San Diego last Sunday afternoon. With the ship in port for the weekend, there were few staff on board so I had a quiet start to my trip. PJ Klavon, the Officer on Duty (OOD) did a fabulous job of keeping me company and patiently answered my questions about the ship, our itinerary, what a “typical day” looks like, and the various roles of the ship’s personnel. As the evening progressed, I had a chance to meet a few other members of the crew. It was great to have some time to take it all in, move into my stateroom, and even enjoy an off-ship dinner in town. I watched the sunset in the harbor from the same deck level my room is located on. Here’s me squinting into the morning sun for a selfie the morning of our launch. My room is on the 0-1 level with a small window looking out the starboard side of the boat. I haven’t written much these first few days for two reasons: 1) there hasn’t been much activity to report on and 2) I have struggled to get my “sea legs” beneath me. The weather north of us has not been cooperating very well and the wind/waves have been rather severe at times. Yesterday winds blew constantly at about 30 knots with periods of time blowing 40-45 knots. The waves were incredible. Quite an experience attempting stairs in such conditions, or trying to fill your plate during lunchtime! The ocean is much less angry today so I feel like I can look at a computer screen for any period of time. I am staying up later this evening to begin the transition to our nighttime fishing schedule. We will be trawling and working on evaluating our catch from about 8 p.m. to 8 a.m. starting Sunday night. I am really looking forward to seeing what we catch! There are opportunities beyond the Teacher at Sea program for those of you interested in seeing what life upon a research vessel is like. 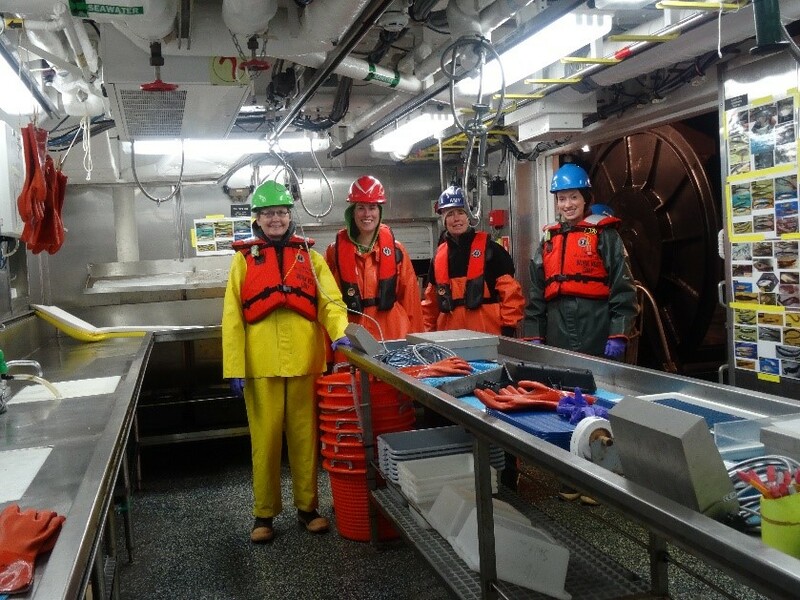 Students with a degree in the sciences and an interest in marine biology can volunteer to assist on a NOAA research trip much like the one I am on right now. In fact, one of the members of the science team on this trip is a new graduate who is interested in getting involved in the NOAA program. You can read more about NOAA and its opportunities by checking out the information available on their home page at NOAA Home.